The Columbans continued their development of the campus at Silver Creek throughout early 1924, with an eye to making Silver Creek their center in the Eastern U.S.A. The Bishop of Buffalo blessed the Saint Columban’s Preparatory College at Silver Creek in the autumn of 1924, on the Feast of the Holy Rosary. The initial class of 24 students began their courses in an old farmhouse on the property in October of 1924. 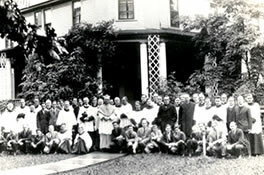 Silver Creek had begun its storied history as a center for Columban formation.